If you want to remodel a bathroom in its entirety, replacing the shower/tub, vanity, cabinets and toilet, you'll have to do an interior demolition, or what is commonly called "gutting" a bathroom. This is not a difficult project, unlike the more intricate and delicate tasks such as installing new fixtures. Wiring and plumbing new fixtures will comprise the bulk of the remodel. However, to ready the bathroom, you'll have to gut it, using several tools. Rent a dumpster. You will need a large receptacle to dispose of all the materials you take up from the bathroom as you gut it. Empty the vanity and all the cabinets. Clear out all toiletries and personal belongings, and put them in another room. Turn off the electricity and water going to the bathroom by switching off the breakers at the main electrical panel and using the plumbing shut-off valve. If your bathroom is not equipped with a dedicated valve, shut off the main water supply to the house. Open the windows to improve the ventilation. Take down the mirrors, using a screw gun, and any hanging cabinets as well. Remove the mirrors and cabinets from the space to have ample room to work. Unhook the sink water and drain lines, using a plumber's wrench. Roll a wheelbarrow next to the bathroom's entryway. Put on safety glasses, gloves and a dust mask. Begin to remove the vanity by demolishing the countertop with a hand-held sledge. These are often too heavy to lift as a whole, so break it up into smaller pieces and toss them into a wheelbarrow as you break up the countertop. Pry the vanity base away from the floor and walls, using a pry bar. Break it up with the hand-held sledge as well. Throw the pieces into a wheelbarrow, and roll it out and empty it into a dumpster. Flush the toilet to empty the tank. Unfasten the toilet's mounting bolts on the floor and the tank mounting bolts connected to the bowl, using a plumber's wrench. Pull the tank off the toilet and carry it to the dumpster. Pull the toilet base up off the floor and carry it out to the dumpster. You may have to use a pry bar to get it free from the floor. Disconnect the faucets in the shower or bath, using a plumber's wrench. Throw them into the wheelbarrow. Demolish and pry out the shower or bathtub with a hand-held sledge and pry bar. 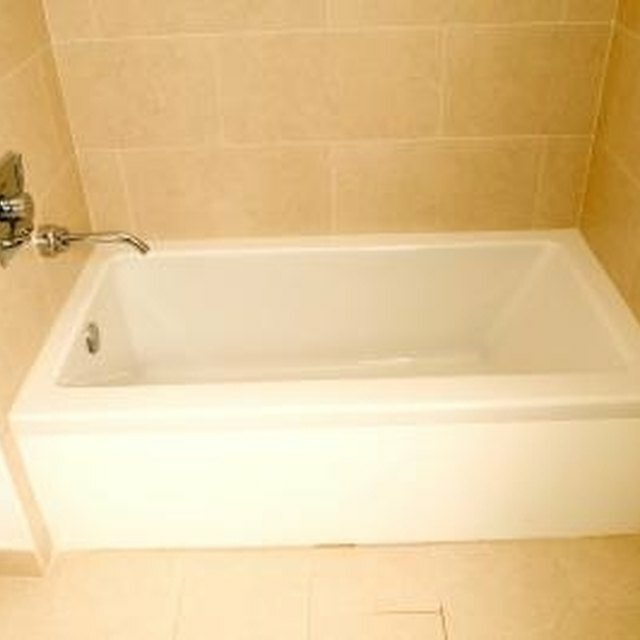 As you demolish the shower or bathtub, toss the pieces into the wheelbarrow. Empty the wheelbarrow as necessary into the dumpster.